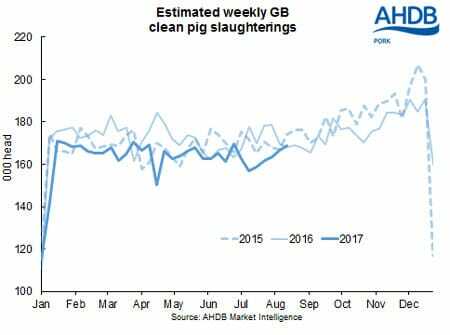 UK - UK clean pig slaughterings fell by 4 per cent on the year in July to 828.5 thousand head, according to latest data from Defra, Millie Askew, Senior Analyst at AHDB Pork. This takes year to date (January – July) throughputs up to 5.9 million head, 6 per cent lower than the same period last year. Sow slaughterings declined on the year for the seventh consecutive month in July. At 17.8 thousand head, the latest sow throughputs are 4 per cent lower than July 2016 and take year to date slaughterings to 134.5 thousand head, 14 per cent lower than the same period last year. The fall in clean pig slaughterings during July reflects the sentiment that domestic pig meat supplies have been tight since the start of the year, driven by an assumed contraction in the domestic breeding herd. However, the continued slowdown in sow slaughterings supports reports that producers are no longer rationalising their herds, with pig prices recovering considerably from the multi-year lows in spring 2016. Average clean pig slaughter weights in July climbed slightly for the first time in five months, to 81.9kg. The current weight is 1.4kg heavier than same period last year. The fall in the number of pigs slaughtered during July, outweighed the slight rise in average weights, resulting in pig meat production falling by 3 per cent on year to 70.5 thousand tonnes. This takes year to date pig meat production up to 507.4 thousand tonnes, 6 per cent down on the same period in 2016.